Welcome to the Junior Science Explorers blog! We will share here some of the projects, experiments and concepts that we explore in the Junior Science classes, which are designed for ages 3.5-5. Water is amazing. Everything that is alive depends on water. Water can exist in THREE different states. Some things float in water, while other sink. There's so much to learn and experiment with when it comes to water. During class, we filled our sensory table with water and then each student chose items to place in the water. There were lots of items to choose from. We gently placed them into the water and saw if they sank or floated. We asked ourselves "What are the forces at work here?" The first was gravity—a cork falls to the ground when it is outside the water because of gravity, but stays afloat in the water because of another force–buoyancy! You can remember buoyancy by calling it “bouncy buoyancy” (say that five times fast). Buoyancy keeps things afloat or "bouncing" on the water. The River Model in our Cochecosystem exhibit is a perfect place to talk about evaporation. You can visit any river, lake, pond or even a puddle to talk about how water evaporates thanks to the Sun and wind. The concept of density goes well with the Sink or Float experiment. You can make glitter bottles to show that the water and the glitter have the same density, which is why the glitter stays afloat when the bottle is twirled. Fluffy and Baron by Laura Rankin is a great story to use to talk about how ducks float in the water and therefore have buoyancy. We’re halfway done with this session of science–I say it every time, but it always surprises me when we get to this point! Today was all about opposites in junior science class! We specifically focused on BLACK and WHITE! It was fun to talk about alllllll the many colors that we’ve learned about and all the shapes and then to step back and look at something as simple as black and white. Then it was onto our first experiment! We explored crayons! We wanted to see if a bunch of crayons on our trays would SINK or FLOAT (opposites!) We dropped in crayons–which made a great splash sound!–and then observed what they did. We noticed something very odd. All of our crayons were sinking EXCEPT our black crayons! Those floated! We learned that black crayons float because the pigment used to make the black color isn’t as heavy as the pigments used to make the other color crayons. Then we tried to see if there was anything on our table that might help the other crayons float. We couldn’t find any floaties or pool noodles–but we did see some salt. What would happen if we added salt to our water? WE tried it! After we added a whoooooole bunch of salt, all of our crayons started to float! We learned that this was because we were changing the density of the water and making it a lot easier for the crayons to float–just like it’s easier for us to float in the salt water of the ocean! 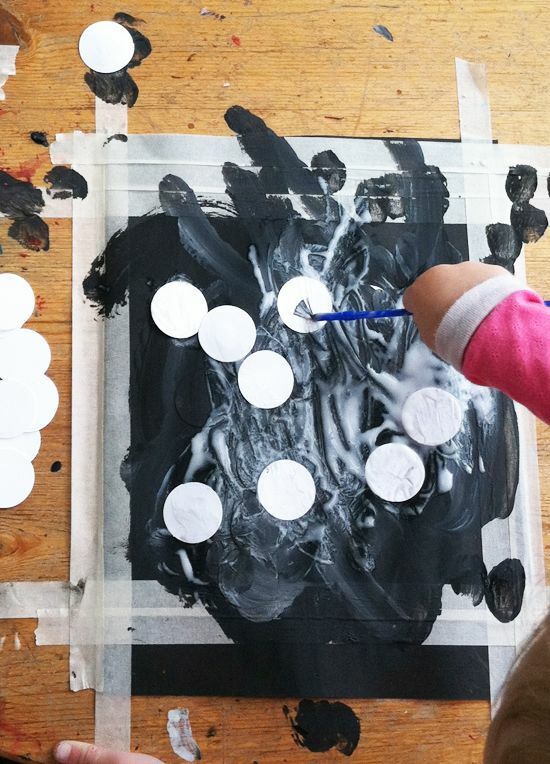 Our next activity was experimenting with black and white paints. We started by using a little brush and trying out some black paint. Then we used a BIG brush and added some white paint. Those become gray! We kept experimenting, added some collage pieces, and just paint, paint painted! Our paintings were still veeeery damp at the end of class, so we’ll have to take them home next week–they’re looking more and more interesting as they dry!